As you can see, the opening can facilitate a single item at a time. How is one supposed to dump a large sack of plastic packages in the plastics bin? How is one supposed to throw a medium-sized plastic object, like a baby's 3-wheel plastic bike? Depending on your municipality, you've probably got other options for recycling of a greater quantity of materials, or materials that are simply too large to place in the appropriate bin. Ideally, these items are routinely collected from your home, or can at least be scheduled for collection, in order to make the practice more convenient. To avoid one or two people filling them up with their haul of stuff, and everyone else piling stuff up around them between scheduled pickups of the materials. Mine are actual converted square rubbish bins. While the lids aren't large, the opening is sufficient to accept something around the size of a sack of fast food. Twice weekly, I see folks from sanitation sorting it all out prior to hauling it off because people consolidate their stuff into a bag, then plop it in. A smaller opening would be less convenient for depositors, but more optimal for the folks that have to actually handle the stuff. It encourages (and sort of forces) folks to take the time to put a predictable quantity of things in (hopefully) the right places. Not ideal, but I suppose a compromise most can live with. 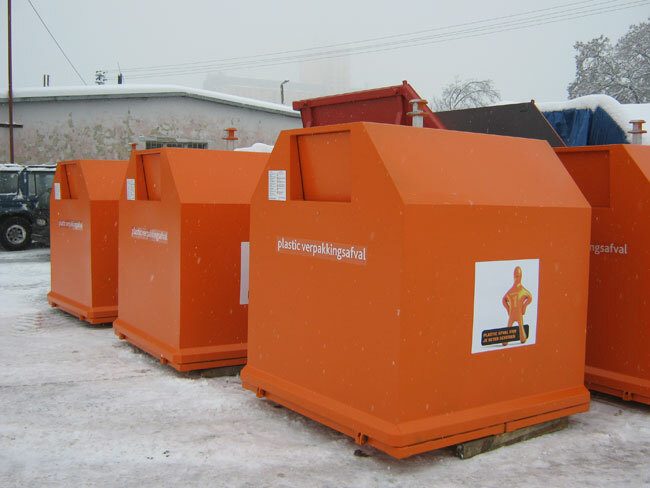 I don't know about the specifics for the recycling bins in the question, but in Sweden, the openings have been shrunk twice, due to accidents. The first time in 1997, two children climbed into a paper recycling bin and were lost as a car came to pick the bin up. Despite that a similar accident has occurred more recently, and the openings are now even smaller, or on older bins, they have had bars welded across the openings to make climbing into the impossible. It does make it significantly harder to get large quantities of material into the bins, but I think the benefits make it worth it. On campus they are just large enough to pass a pop can. They are designed this way to reduce theft. Once you have the bins in place, the contents are tempting targets. A bin made from a steel drum will hold several hundred cans. That's about 30 bucks worth at the bottle depot. It also reduces casual use for paper disposal. In particular the openings are too small for most cardboard coffee cups. There is usually a garbage bin with a larger opening nearby, but even those bins have only a 6-8" opening in them. THAT keeps the crows out. The crows will tend to scatter garbage. Doesn't stop the sparrows and wrens snerkling about looking for bread and cookie crumbs. 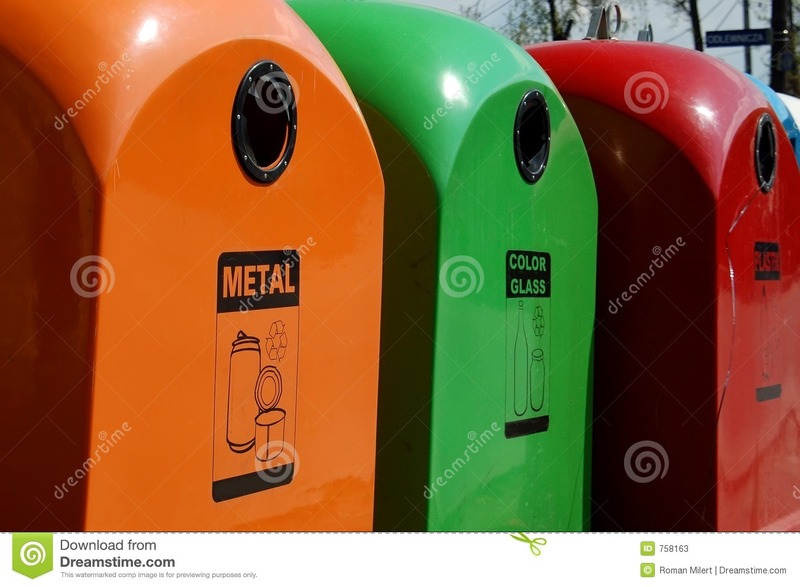 From the picture, it looks like your municipality ordered the same bin type but in different colors for different types of waste. The small openings seems sufficient for dumping glass, plastic bottles and perhaps also metals depending on which metals are allowed in there. However, if your municipality allows all plastic types in the plastic bin, then I'd say they made a mistake by not making the opening of the plastic bin larger. Where I live, people usually collect all plastic wastes in a plastic bag and toss that in the plastic bin once or twice a week. Such a bag full of plastic wouldn't fit in the bin in your country, but here we've got much bigger bin openings.